Ezymats is a leading supplier of EVA interlocking jigsaw mats, gym mats and safety flooring in Australia. Ezymats supplies quality mats manufactured to ensure maximum protection for its users. Our EVA jigsaw mats are trusted by customers throughout Australia including schools, daycare centres, kids play centres, and training and law enforcement organisations. Ezymats are professional mats suitable for both commercial and domestic applications where interlocking flooring is required. Our jigsaw mats come in a variety of size from 20mm to 40mm thickness. The are also a number of colour options available for our jigsaw mats. There are blue/red mats, black/grey mats and black/red mats. Our jigsaw mats are also available in other colours on special order. Colours like blue/yellow, yellow/green or solid colours are ready available. We can also PMS colour match the mats but there is a minimum order quantity. Ezymats also offer quality vinyl tatami mats and MMA mats. The tatami mats and MMA mats are 1×2 meters and are available in either black or grey. Ezymats tatami mats and MMA mats are available on special order in other colours. Whilst the tatami mats are the same size and thickness they differ in the finish. The tatami mats have a traditional tatami finish. The MMA mats have a smooth finish to reduce mats burn. We can also supply both style mats as 1×1 meters if required. An EVA jigsaw mat is manufactured using expandable foam. 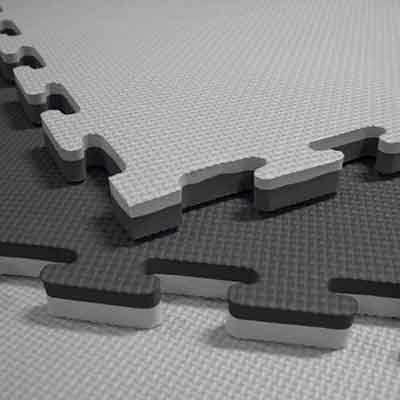 Interlocking EVA foam jigsaw mats (also known as puzzle mats) have become very popular over the last few years. Jigsaw mats are much more affordable compared to the traditional vinyl and tatami mats and can be used for many activities that include, MMA, BJJ (Brazilian Jiu Jitsu) Aikido, Kempo, Jiu Jitsu, Karate, Ninjutsu, Kung Fu, Wing Chun, Yoga, Taekwondo, Hapkido, Capoeira, Kick Boxing and Boxing. Jigsaw mats as the name implies are shaped like a jigsaw. The jigsaw method allows the jigsaw mat to lock in to another thereby extinguishing the need for tape of other methods to keep the mats together. These mats can be connected seamlessly to create a large area perfect for various training activities. The EVA jigsaw mats can be cut to fit tight corner and irregular shaped areas. Jigsaw mats are also known as puzzle mats, jiu jutsu mats, wrestling mats, judo mats, karate mats, gym mats, taekwondo mats, MMA mats, rubber flooring, interlocking mats, martial arts mats, BBJ mats, wrestling mats, fitness mats, gym flooring, play mats, rubber floor tiles EVA floor mats and gymnastics mats just to name a few. Gyms have a huge need for mats whether they are a professional gym or home gym. The mats are necessary to mitigate the effect of jumping up and down which can have an effect on the joints and muscles and practitioners. Mats are required to have anti-fatigue properties in order to allow for the practitioner to pursue their activities as vigorously as possible. This is where gym mats come into the equation. We at Ezy Mats are professional supplier of mats. These are mats, as already mentioned, are commonly used in gymnasiums or gyms. Whether a person is doing gymnastics or some other activity they will often refer to them through some generic term. Jigsaw mats and vinyl mats are also know as gym mats. Gym floor mats are used as an anti-fatigue mats to relieve pressure from jumping up and down. Engaging is vigorous exercise can cause unnecessary pressure on joints and muscles. Most aerobic and boxing gym (amongst others) use interlocking gym jigsaw mats to alleviate joint fatigue and minimise use injury. Among the many types of gym mats, EVA mats are perhaps the most popular. Gym mats are also available in vinyl mats such as our tatami mats and MMA mats. 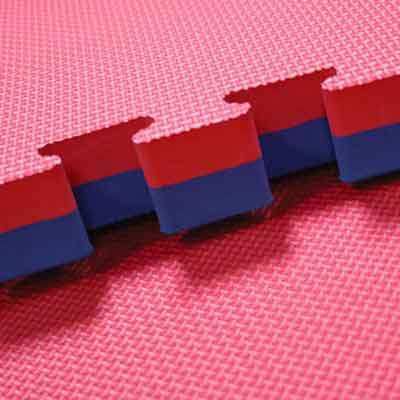 As stated above interlocking jigsaw mats for activities like aerobics, martial arts and gyms are a popular choice. They are easy to assemble and absorb the impact of jumping during strenuous activities. Interlocking mats have the jigsaw puzzle mechanism which allows the mats to be locking into place better. Often when you set up your exercise mats if they don’t have the jigsaw puzzle mechanism of have a non-slip back then they come apart easily. By having mats such as our interlocking mats then you don’t have to worry about this. Just as with a jigsaw puzzle it is almost impossible to simple pull the interlocking mats apart. Many organisations have benefitted by having mats with the puzzle shape. They save both time and money. Foam mats is another name for EVA foam mats. Foam mats or EVA foam mats come in this form of mats. So jigsaw mats and puzzle mats are often called foam mats. They are also referred to as EVA foam mats as they are literally made from expanded foam which is allowed to expand to the required thickness. The reason EVA mats are also referred to as foam mats is because EVA is a form of expandable foam. The foam mats are available in different hardness depending on the application. They are also available in different thicknesses such as 20mm, 30mm and 40mm foam mats. Colours include blue / red, black / grey and black and red mats to name a few. Other foam mats are available as well. Tatami mats originally were Japanese mats made with bamboo. Today a tatami mats is a vinyl mat with the traditional tatami finish. Tatami mats are generally made from vinyl and have a compressed inner foam. Tatami mats are used by many different martial art including judo, MMA jiu jitsu, aikido etc. Tatami mats are also used for all forms of training where a durable mat is required. Tatami are available in 40mm with density of 230kg/cbm. Tatami mats and are available 1m x 2m. Our tatami mats come in two popular colour black or grey. The tatami mats are made from heavy duty vinyl for added durability. Our tatami mats are the best priced tatami mats in the Australian market. What are Tatami Jigsaw Mats? Tatami jigsaw mats are eva mats with a tatami finish. Tatami jigsaw mats are great for people who want a traditional tatami finish on training mats. The tatami finish is based on the traditional Japanese tatami mats and are also found on our tatami mats. The tatami texture is often preferred by traditional Japanese martial arts such as karate, aikido and jiu-jitsu. That said they are also popular with other activities due the textured surface which offers good grip. What are Martial Arts Mats? Martial arts mats are just another name for our training mats. A martial arts mat is a mat or set of mats used in martial arts training. Our martial arts mats are made of EVA foam which is an expanded foam which absorbs impact like jumping or falling. We also have mats which are made from heavy duty vinyl and compress foam. They come with either a smooth surface or traditional tatami finish. Our wall mats are also suitable for martial arts training areas as they offer protection from impact with walls during training or sparring. Our EVA martial arts mat employ a jigsaw system which allow the mats to interlock with other mats. This is great for both permanent and temporary setups. The EVA mats are light weigh and are easy to move around and transport. For a long-term solutions you may want to consider our heavy duty vinyl mats which are more expensive but offer a premium training mat experience. Our martial arts mats are suitable for all different martial arts styles. For martial arts like karate and tae kwon do users tend to chose 20mm or 30mm foam mats. For martial arts like judo and jiu jitsu, or any grappling arts, user tend to go with 40mm mats as they absorb more impact or the MMA or tatami type mats. It is the users responsibility to determine which mat are suitable for their activity. So if you are training in martial arts then we have your mats needs covered. MMA mats are training mats that are used for Mixed Martial Arts training. We also currently have MMA mats available which come with a smooth surface to prevent mat burn. These mats are the same as tatami mats in that they are 2m x 1m and are made with compressed foam and vinyl. The major difference is that they don’t have the traditional tatami finish instead coming with a smooth finish which is increasing more common with MMA mats. They are very similar to Zebra Mats™ (a popular brand of MMA mats) both in look and feel. Although our MMA mats a lower cost solutions to Zebra Mats™ * as they are manufactured in China as opposed to Germany of the USA. Our MMA mats are manufactured to our strict standard to ensure longevity. If you require MMA mats with a smooth finish contact us for a quote. Are EVA mats and Rubber mats the same? Rubber mats are usually black with different colour flecks. They can also be found in other colours. Rubber mats are heavier and more dense then EVA interlocking jigsaw mats. Rubber mats, invariably a polymer, are a type of artificial elastomer mainly synthesised from petroleum byproducts. EVA is one of the materials popularly known as expanded foam or just foam. Both are available as interlocking mats. So an EVA mats differs from a rubber mat in that an EVA mat is manufactured using foam and a rubber mats is manufactured using rubber. Ezymatsare the premier supplier of jigsaw mats in Australia. We have supplier thousands of interlocking jigsaw mats and vinyl mats. We supply safety mats to a large range of customers through out the country. They include martial arts schools (BJJ, judo, karate etc), police, gymnastics and many other training organisations. Ezymats have stock available in both our Sydney and Melbourne warehouses ready for dispatch to locations through out Australia. We also have mats arriving on a weekly basis to replenish our stock. If you need anti-fatigue mats for whatever purpose you can’t go past Ezymats. Not only are our jigsaw mats amongst the cheapest in the market, we also have a large variety to choose from and offer great customer service. Whatever your need we will help you find the right EVA jigsaw mats for your application. Where are Ezymats Mats Sold? Our exercise mats can be purchased online. We have a web store where customer from around Australia can purchase their excursive mats which can be shipped around Australia. Ezymats also has stores located in Sydney and Melbourne. Our Sydney Mats store is located in Belmore. Our Melbourne Mats warehouseis located in inner Melbourne. Both stores are centrally located and pick up can be arrange during trading hours. Yes we offer delivery anywhere in Australia. We usually dispatch the mats in bags as it is cheaper to ship for our customer. If required the jigsaw mats can come packed 5 pcs for carton. The cartons are 110mm x 110mm x 25mm and weigh 20kg when packed with mats. We generally use TNT but can offer other options if required. We deliver to all states and territories in Australia. Let us know you delivery address and quantity and will will arrange a quote. Ezymats also have a freight calculator available in our check out section which allow you to pay for freight when ordering your EVA jigsaw mats. The shipping calculator calculates mats shipped in bags. Do Ezymats offer vinyl mats? Yes we do? Should you require vinyl tatami mats let us know and we will arrange a quote. 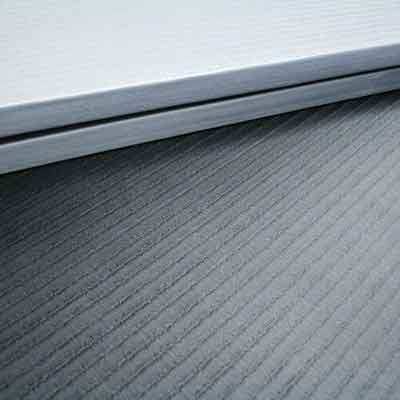 We have black and grey vinyl tatami mats in stock. If you require other colours we can add them to our next shipment of vinyl and jigsaw mats. We have goods on the high seas all the time. Vinyl tatami mats are ideal for activities where there is a lot of throwing like judo, wrestling, hapkido and Chin na. They are available in 40mm and 50mm thickesses and are 1m x 2m. Are Ezymats good for gyms mats? Absolutely. EVA jigsaw mats are great as gym mats whether for professional gyms or home gyms. They absorb impact from jumping activities and protect flooring from dropped weights. Jigsaw mats are especially great for aerobic activities and other activities such as dancing, pilates, yoga etc. Eva interlocking jigsaw mats are anti-fatigue mats which alleviate pressure on the body and joints when jumping and performing other vigorous exercised. Using jigsaw mats when exercising offers better protection when exercising than hard surfaces like concrete. Jigsaw mats can vary in size even in the same batch. Therefore mats advertised as 40mm jigsaw can different in thickness by plus/minus 1-2mm. This is the same with other thickness such as 20mm and 30mm mats. 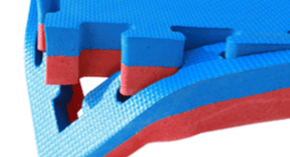 As jigsaw mats are manufactured with expandable foam it is impossible to ensure that all mats are exactly the same thickness. It is important to consider this and other characteristic of EVA jigsaw mats before making a purchase. It is also important to note that the colour of mats can vary from batch to batch and may not be the same shade of colour as mats advertised on this website. If you are matching mats with previous order or mats ordered from other supplier please request a sample for matching. Ezy Mats are more then happy to supply a sample (at the customers expense) for testing. * The Zebra Mats name is a trademark of Zebra Inc and is in no way associated with Ezy Mats Pty Ltd or an affiliated organisations.